Eversharp Symphony Deluxe model 703 second generation fountain pen from the late 1940s. Lever filler in black with a chrome plated steel "slipper" style cap and gold plated trim. 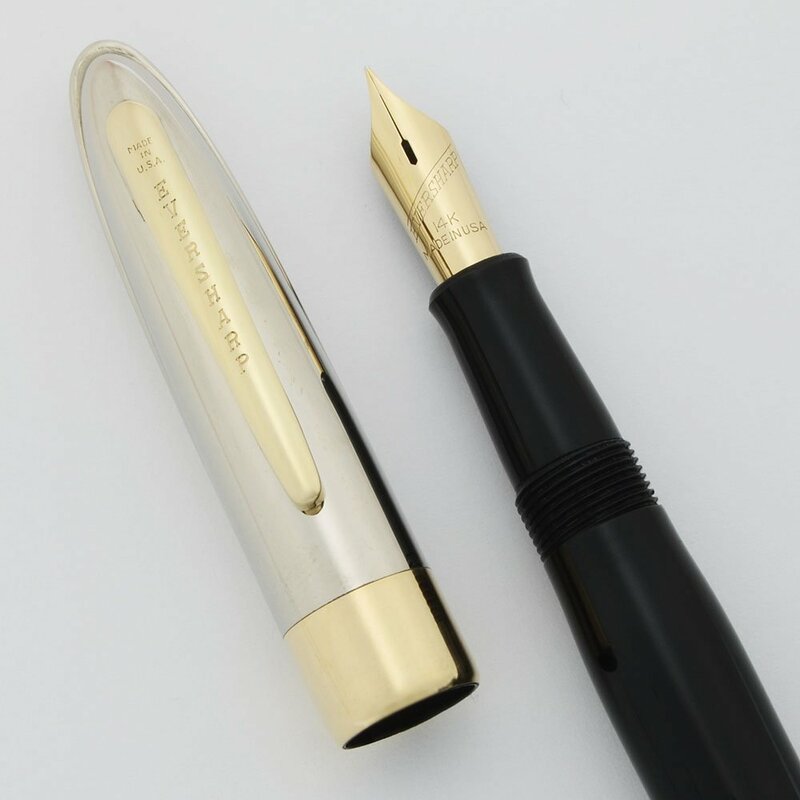 The Deluxe name refers to the wide gold plated cap band. Fine 14k nib. Excellent + condition. Type Lever filling fountain pen, restored and working well. Manufacturer and Year Eversharp, made in USA -- 1949-50. Filling System Lever filler. We've restored it with a new sac and it's working very well. Color Black body with a chrome plated cap and gold plated trim. We've seen the cap referred to as chrome plated and as stainless steel, but it's clearly plated based off of when we looked at caps with heavier wear. The trim includes a 3/8" wide cap band. This is the slipper cap version. Nib FINE Eversharp 14k nib. It writes smoothly. The nib is only slightly springy. Condition Excellent + condition. No dents or major scratches. There are two pitting spots on the cap. There is also also a little plating wear on the lever. There are some marks on the cap band. We've fully restored the pen and it is working well.